The year 2012-13 brought in itself many changes in the form PBL. PBL was an entirely new concept for us. It required rigorous training and practice. i. How to go about it? ii. How to have a project that catered to the special needs of each student? iii. How to carve the Driving/Essential Question and revolve the project around it? iv. How to incorporate the 21st century skills in the project? After learning the minimum requirement for the project, we began working as small groups to get it started. Our project was ‘Myself’. Eventually, training session to build upon our project became an inevitable part of the schedule. Fruitful suggestions helped us to revamp our planning and execute it effectively. TOK reflected at each step. Whether it was to decide the different roles of a person for ‘Myself’ project or to select the leaders for a sub-topic, the inquiring and analytical mind was coerced to function. Other than the project, the triage talked a lot about social emotional intelligence. In one of the discussions, we listed down the fears we noticed in students-their cause and effect and the process to minimize them. This helped us realize that we need to be more accountable and sensitive towards our students. The discussions were always overflowing with knowledge, references and understanding which always kept us thinking and to some extent made us working. The Report Card session was one such where we collectively tried to design a report having all the components that reflected the progress of the students. The highlight of these sessions was that none were devoid of ‘voice and choice’. (We need training in how to use ‘voice and choice’ which is all together a different story. ) The training was always in the form of interaction reducing the affective filters. In another instance we were guided how to write an essay for ‘personal project’. Many aspects came into view-an essay has to be written on a biting question for which you undertake a study. The language features helped me identify another genre of creative writing. In one of the sessions the heterogeneous group was asked to prepare a lesson plan that integrated two or more than two subjects. The planning was meticulously done. Though, the execution was derailed as the time-table was already fixed and the inter-mingling of the teachers had not yet crossed the barriers. 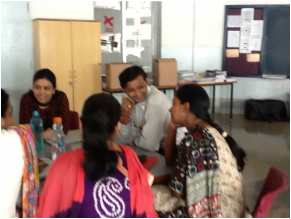 The sessions taken for the students and teachers on Habits of Minds- Persistence and Metacognition were equally interesting. Time crunch was the only issue. Apart, from the regular training sessions, I would consider the one-one counseling sessions no less than any other pronounced training. Whenever in emotional trauma, these sessions trained me to become less impulsive and perceive every situation pragmatically. This even helped me evolve as a healthy-minded person, neither demeaning my duty nor the course detrimental. Mirrors don’t always Reflect best what one must ‘see’ and ‘observe’! Best reflections happen through the process of exfoliation, peeling layers of our current understanding and getting to know the second skin that exists in each one of us. Our DNA and brain together make that happen. Our environment- which we at times call as ‘nurture’ just adds some spices occasionally. ‘Reflections’ are stepping stones for our internal (may be eternal) growth. How does one reflect? One reflects by asking and challenging beliefs. One reflects by reflecting on ‘words and their intent and their meaning’ and by using ‘figure ground perception’- one sharpens one’s ability to reflect finer each day. This reflection is not for material benefit. Though it has, like any other thing capacity to take you through this process. Reflection is ones’ ability to look upside down, the other way, the third alternative, the point beyond…. Happy Reflecting! This is our first step towards the journey where ‘destination’ is the ‘ability to think’- think continuously…. Think for change….. Think for better tomorrow…. Think for self… for mankind… for all that is known and unknown and needs to be explored! Metacognition: - is this word helping me exfoliates my thinking? What triggers my thinking now? If given a choice what is it that I would like to add to these discussions? What format of this discussion is taken beyond classrooms, in your daily life, in your talks with friends, family…. What makes you think that this should last….. …………………………………….or stop because……………………………………………………………..